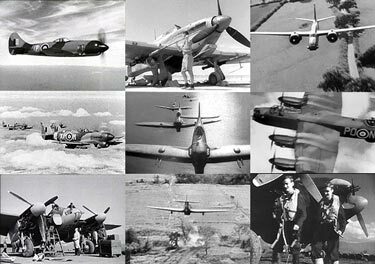 "The Gen" was a film news series produced the Royal Air Force & shown to service personnel, selected scenes from which are shown here. Highlights include R.A.F. Douglas Boston Attack Bombers make a very low level attack on an armaments factory in France, "The Independent Air Force" & their de Havilland Mosquitoes, Group Captain Percy Charles "Pick" Pickard's last mission, a low level precision Mosquito strike to free French Resistance fighters from a German prison in Amiens, France and R.A.F. de Havilland Mosquito fighter/bombers use rockets and canon to support the Allied breakout from Normandy after the D-Day landings. G.C. Pickard, who gave his life on the strike on the Amiens prison, is also featured as the commander of R.A.F. Wellington Bomber F for Freddy in the classic film "Target for Tonight" . Get this video "R.A.F. Bostons, Mosquitos, Normandy Typhoons &G.C. Pickard's Last Mission"